"Hi there, wondering if any of you would know what to price a 1969 350cc Enfield Bullet? My friend lives in India and shipped it over to me about 5 years ago. It's titled and the speedometer says 1049 km. It hasn't been restored but it's in good shape. Just needs a tune up as I haven't ridden it in a few years. Thanks!" Erik did not attach a picture. Anyone have an answer for him? Comments can be made at the bottom of this post. My own first thought, Erik, is that you haven't told us some things we would want to know. First, I assume that the 1,049 kilometers represent only the distance traveled since the odometer was replaced. A 1969 motorcycle would certainly have gone a greater distance than that in its life. But is it really a 1969 motorcycle, or is that just what it says on the title? The low numbers on the odometer make me suspect this may be a newer motorcycle snuck in on vintage papers. A true 1969 Royal Enfield built in India would not be as well made as a newer Royal Enfield built in India. Quality improved over the years. A motorcycle that old might also have age problems (such as rust inside the tank). Even if it is in fact newer, it's hard to know much for sure unless you can get the bike running and try it for compression, shifting, good brakes, clutch, cables and electrics. How's the paint? The chrome? You say you haven't ridden it in years and it needs a tune up. Does it also need a battery? Probably. Has the gas turned to sludge in the carburetor? I hope not. Are the tires checked from age? There's a good chance they are. Beyond that, questions arise about the title. Personally, I'm always nervous buying any vehicle from a private owner until I walk out of the Department of Motor Vehicles with my new license plate in hand. Buying a motorcycle privately imported (perhaps through altering its paperwork) makes me skittish. Even if I can get a title in my name now, is there a possibility that I might have trouble selling it in the future? We can't know that, but a buyer is going to have to take it into account. Buyers have a choice: there are plenty of used Royal Enfield Bullets for sale around the United States with very low mileage, reasonable prices and unimpeachable titles. Their odometers read in miles, not kilometers. On the other hand, you may have something special someone wants and will pay extra to get. There aren't that many old 350s in the U.S. and those we got had the balky left-hand shift mechanism. Some buyers will like the fact that your motorcycle shifts on the right. Someone may have added nicer vintage seat, controls and tail light. Most important is the fact that Royal Enfield motorcycles are still for sale brand new, for reasonable prices. 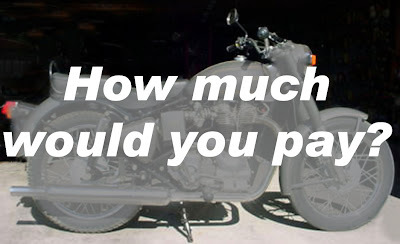 Your motorcycle is not a collectible and, with many thousands made, likely will not become one. Thus it is certainly not worth more than a new Bullet. Classic Motorworks, the U.S. importer, says the suggested retail price of a new AVL Bullet (the newest and best example of your motorcycle) is $5,349. Your Royal Enfield is also certainly not worth nothing. How much you get for it may depend on where you advertise, how it looks in its picture, where you are located and whether riding season is over soon in your part of the country. My advice: get it running, if it's not, fill in all the details you can, take pretty pictures and advertise it soon. If it doesn't sell, drop the price and then drop it again if you have to. The market place will tell you when it's right. You should post this on Craigslist itself! People need better ads for their bikes.